...And You Will Know Me By The Trail of Papers: Channelrhodopsinning: Your light doesn't always do what you want. Channelrhodopsinning: Your light doesn't always do what you want. Two years ago, I wrote a post about the common mistakes I notice in channelrhodopsin papers. Since then, two labs have developed improved photoactivatable chloride channels for inhibition, binary logic has been introduced to neurons, and you can use one vector to photostimulate and record from a neuron type. Beyond those headline advances, though, were some smaller papers that highlight some of the pitfalls of channelrhopsin use. As always, given that I've published exactly one paper using ChR2, take these opinions with a Churymov-Gerasimenko comet of salt. In that post two years ago, I laid out my Two Pillars of Channelrhodopsin: always perform negative controls (I'm still surprised that this actually needed to be said); and always pulse your light. In particular I was critical of a paper by Kravitz and Kreitzer wherein they used the PINP/phototag technique to record from medium spiny neurons (MSNs) in the direct and indirect pathways of the striatum. To identify, for example, direct pathway MSNs, they expressed ChR2 in those cells, recorded from them, and stimulated with 1 second long light pulses. Units that responded to light with short latency spikes (less than 15ms ) were considered identified. At the time I called this a "crap criterion," because I thought the time window was too long to precisely identify neurons. Medium spiny neurons have two properties that make them unsuited to identification protocols that require high spike fidelity [ed. note: pulsed light stimulation]. 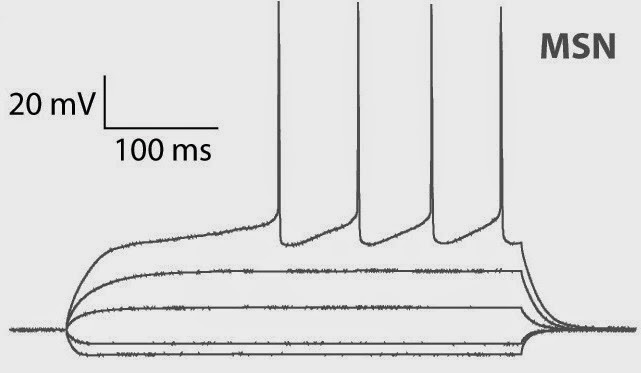 First, medium spiny neurons have very low excitability [for an example of MSNs' late firing properties, see the figure below, from this review by Kreitzer], and fire at low spontaneous rates in vivo. It is therefore difficult to drive them to spike reliably and at short latencies without using extremely high-powered illumination... Second, medium spiny neurons have variable membrane potentials which continuously fluctuate between approximately −50mV and −80mV in vivo. As we cannot monitor the membrane potential in our extracellular recordings, we do not know whether the cell is close to spike threshold when we deliver each laser pulse... While it would be simpler if identical techniques could be applied for optogenetic identification across multiple brain structures, it appears that optogenetic identification procedures will need to be optimized for each different brain structure, a situation that occurs with nearly all technical approaches in neuroscience. MSNs are really hard to stimulate. Recordings from an MSN in response to current injection. MSNs only fire an action potential after prolonged stimulation. Since then, I have recorded from MSNs in GPR-88 mice using an optrode, and I can confirm that neurons respond robustly to long square pulses (>10ms), but not to trains of short pulses. I was wrong, and I apologize to the Kreitzer lab. While a yield of ~2 units per mouse seems low, if you run the numbers it makes sense. In many brain regions, half of the units you record will be from non-target neurons, and of the target population only a fraction of the neurons will express ChR2 at a high enough concentration to be usable. So in the end, only ~10-30% of the units you record, if you are doing everything right, will express ChR2. If you record 20-30 units / mouse, which seems reasonable to me, you would end up with a high of 2-9 neurons per mouse. If your brain region is smaller, these yields would drop. While the Kreitzer lab showed how long light pulses can work, former Duke post-doc, now Baylor PI, Ben Arenkiel put out a paper that highlighted why, in general, I prefer pulsed light. They expressed channelrhodopsin in a wide variety of neuron types throughout the brain (mitral cells, cortical pyramidal cells, interneurons, and more), and patched onto them. While they were recording, they stimulated with trains of light, varying the frequency and the duration of each pulse (from 1 ms to 49 ms (or near constantly)). They found that, as you increase the pulse duration, stimulation fidelity decreases, and you in fact can begin to inhibit neurons. The idea that prolonged stimulation could cause inhibition is not new - we've known about shunting inhibition for a while - but now we have evidence that it can happen with channelrhodopsin. More intriguing, the response depended on neuron type. 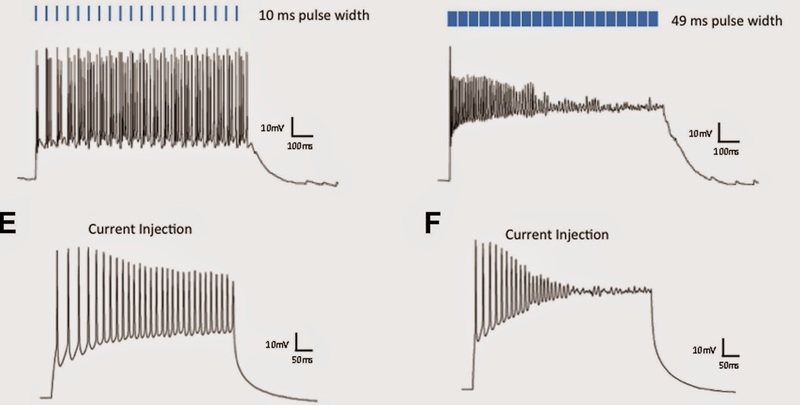 Most neurons, presumably with low basal firing rates, were inhibited by prolonged light, but a subset of fast-spiking neurons were actually even more excited by constant photostimulation. My conclusion from this paper is the same as that from Kreitzer's review, "optogenetic identification procedures will need to be optimized for each different brain structure." You need to record from your neurons of interest in slice, or if you can't, ask those weirdo slice physiologists down the hall for a solid. You need to know how fast you can stimulate reliably, and how long your light pulses should be. Otherwise, you might be inhibiting the neurons you are trying to stimulate, or making them fire faster than you thought you were. So you've recorded from the cell type you want to stimulate, and ran the cells through their paces to choose a stimulation paradigm. You're good to go, right? 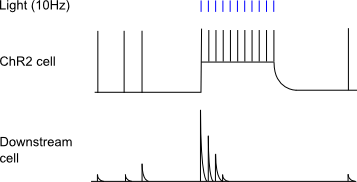 In the middle trace, the cell expressing channelrhodopsin easily follows the 10Hz train. However, in the bottom trace, the downstream cell receives a strong EPSC for the first light induced action potential, but the EPSCs get smaller as the vesicle pool is depleted, until they all fail. Then, after the stimulus is ended, there is a refractory period where synaptic activity is absent. This is, of course, an obvious result if you think about it. Yet I hardly ever see it mentioned. Just because your neuron can follow your channelrhodopsin stimulation doesn't mean that it's actually releasing vesicles. So be careful out there channelrhodopsinners. Choose the right stimulus paradigm, make sure it's not inhibitory, and hope that the axon terminals can keep up with the action potentials. Your light doesn't always do what you want.